59445-SS-PK is rated 5.0 out of 5 by 2. Rated 5 out of 5 by Creekmom28 from Great Product! Love the hand shower wand. It easy to use and hold. Rated 5 out of 5 by Xeen from What an improvement! 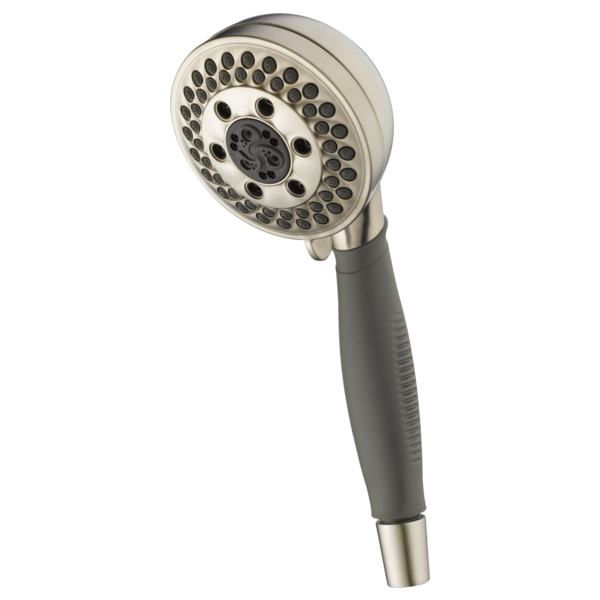 I had a 2011 Delta hand-held 2.0 gpm shower head. I have only had one shower with this new shower head, and I am very enthusiastic about it. Even though it has the same gpm as the old shower head, the experience is markedly different. I had it on the regular spray setting and felt very stimulated and awake afterwards. I can't wait to try the other settings. The design is a bit clunky, and that's probably because they are trying to get a lot of functionality into a small volume. Does it require a seperate vacuum breaker to meet code? I tried a different shower head in a bath showroom that uses the H2O Kinetic technology and I loved it. But we have very hard water and want the &quot;self-cleaning&quot; rubber nozzles. Does the H2O Kinetic function use the rubber nozzles? Is the handle grip rubber? Thank you for your question. Delta Faucet model # 59445-PK is the handshower only. The hose is not included. If you would like the hose and wall mount included, we recommend Delta Faucet model 55445.